One of the most delightful Christmas traditions is sending your friends and family holiday greeting cards. Many crafters love to make their own Christmas cards because you can choose your own designs and sentiments. We've rounded up 26 DIY Christmas cards that are perfect to try this season and will serve as inspiration for your own holiday crafting! Needle crafters can practice a few new stitches to create this unique and pretty card. The tutorial comes with a free printable template, so no need to worry about coming up with a pattern. This DIY card is perfect for the crafter that has good calligraphy skills. The next time you're at the craft store, pick up some polka dot kraft paper and premade tags. Wrap the bottom of the tag with washi tape and write your Christmas message on top of the tag. Are you in a hurry and looking for a simple DIY Christmas card craft? This washi tape card is for you! Just cut strips out of washi tape and place on a card in the shape of a tree. Put a star on top and your card is ready to send. Practically Functional offers a free printable Christmas card that is designed with enough space to glue on an eos round lip balm. This Christmas card is the perfect small gift for someone you want to acknowledge at Christmas without spending a lot on a gift. These cards are easy, thrifty, and most-appreciated in winter when chapstick is necessary! Create these lovely red and white holiday cards by sewing gingham cloth onto a white cardstock backing. The design is simple yet elegant, and doesn't feel too specific to any holiday. Some people are too intimidated to try making a pop-up card. We promise you this card is very, very easy. Just cut the shapes out with the files provided and follow the simple gluing instructions. You'll have beautiful cards in no time, which you will be proud to send to your friends. Although this craft is originally a paper garland tutorial, you can also use it as a Christmas greeting card. Just write your message and fold the garland to fit into your mailing envelope. The recipient will not only have a Christmas card but will also receive the cutest Christmas snowmen that they can use as holiday home decor. Make a beautiful Christmas tree card with green ribbon and red buttons. This tutorial is in Italian, but you can easily translate it in your browser. It's also so simple—you need only to follow the pictures. Kids love getting into the spirit of the season. Have them make their very own Christmas cards with this handprint card craft. Parents, Grandparents, Aunts, and Uncles will treasure these precious handmade greeting cards from the little ones in the family. Make a beautiful contemporary-style Christmas greeting card from paint chip cards. If you don't have any leftover from your last painting project, just head to the hardware store—they're free! Cut the paint chip card into a triangle, glue onto a card, and add some embellishments. You can make this card in literally under five minutes. We all love that! These Christmas cards remind us of the beautiful scherenschnitte cards of previous centuries, but instead of being painstakingly cut out with scissors, they can be quickly cut with an electronic die cutter. They are so pretty, you may want to frame them. Christmas cards can be made from a variety of items and this year you may want to skip the paper try something different. These cards are made with iron-on patches, which give them an added layer of texture and personality! Twist green pipe cleaners into a tree shape and embellish with a gold star. You might want to make a bunch of these cards with your kids. It's so easy, that even your little ones will be able to "help." Working on a card together is an excellent way to build family memories. Make gorgeous cards with just glue, cardstock, and bakers twine. These cards are simple, yet elegant and you can use any leftover bakers twine to create DIY garlands for your tree! Bunnies aren't just for Easter! Give your holiday greeting a twist this year with hand-painted woodland creatures. These rustic cards look best when they're not perfect, so don't stress too much about the painting part! String art has been quite trendy for the past couple of years, and this project turns the technique kid-friendly. Using a sewing needle and thread instead of nails and a hammer, older kids can begin to learn how to sew with this project. Learn how to make your very own light up Christmas greeting cards with copper tape and Chibi Lights (light up stickers!). Lawn Fawn has a YouTube video available that you must check out! Try this craft for a vintage and nostalgic feel to your holiday cards. Make a pretty Christmas card in shades of brown, decorated with wooden shapes, stickers, and bakers twine. Whip up some paper cut lettered holiday cards in minutes with these free download files provided by Persia Lou. This craft is perfect if you're making last minute cards. Even though they look as though you labored for hours making them, the secret is that they are fast and easy when using a die cut machine. Kids will enjoy this holiday card craft. They can make the cards, insert a special message, and then play with them afterward. Free templates are provided for download, so you are almost guaranteed a successful reindeer puppet outcome. Are you looking for a fast DIY Christmas card? Just print the elegant green Christmas ornament onto a piece of white cardstock and fold. Instant cards you can make and mail. Crafters who own electronic die cut machines can cut out paper elements with precision. White House Crafts gives a lovely free SVG Christmas village file to help you make beautiful cards in a hurry. Make some nontraditional, geometric cards with a black and white theme. Although you can cut out the design with a ruler and Xacto knife, this blogger recommends using a machine such as a Cricut Explore or Silhouette device for perfect cuts. 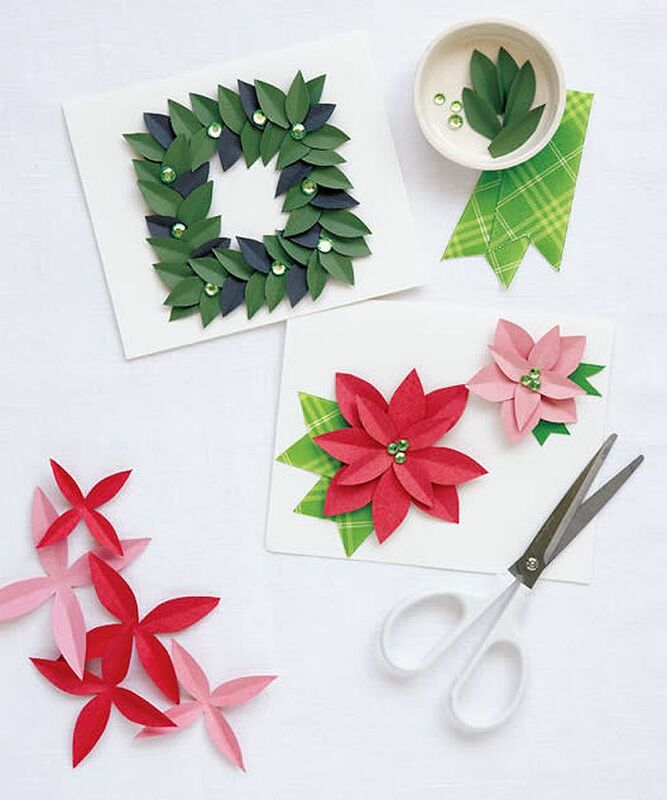 Make some simple, easy, and stunning paper poinsettia and magnolia cards for your friends this year. Just cut paper shapes from the free templates provided and glue onto a cardstock backing. Add some bling, and consider your project finished. Give a DIY touch to your Christmas card crafts with a bit of embroidery floss applied in simple shapes to a cardstock sheet. If you are good at calligraphy, you can use your skills to make gorgeous cards with hand-drawn messages. These cards are so pretty, that some people may even want to keep them in a frame.